We offer a wide selection of pool tables ranging from a basic table for your rec room, to an elaborate centerpiece for your billiards room, and everything in-between. We find the best tables across your price range, then offer them to you for less – and with no hidden charges. Are you moving and want your table to come with you? We can take apart, move, and put it back together again. You won’t have to lift a finger. Is your felt looking and playing a little rough? We can fix that. We have the best felt in stock, and it’s ready to be put on your table. Getting funny rolls? Have our trained professionals level your table. Don’t lose another game because of a bad roll. Are your rails tired? It’s time to get the bounce back. New rails = new life. Olhausen® has been building pool tables since 1972. 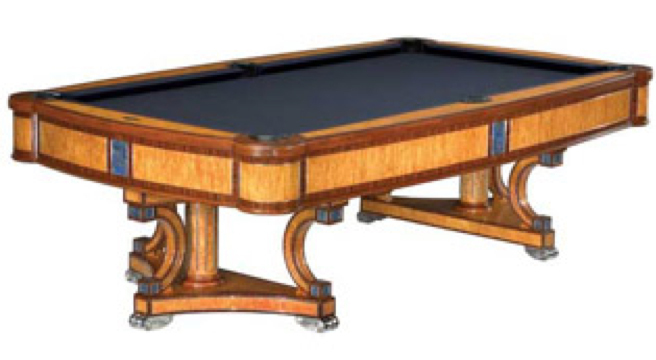 They use American-made products to design and build what is known in the industry as the “Best in Billiards®.” They offer every type of pool table imaginable from ornate pieces of furniture to professional tournament tables. 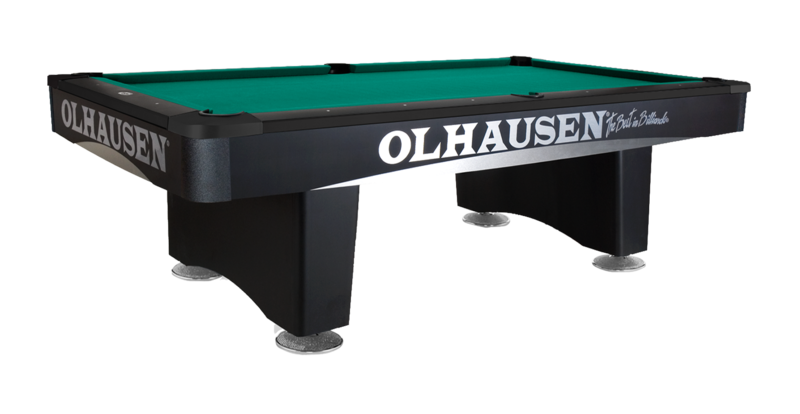 Custom pool table designs are also available from Olhausen. 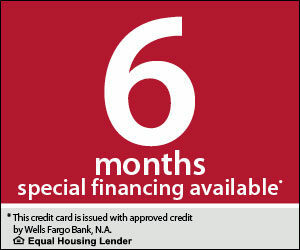 Stop in the store today for details. Olhausen’s finest tables, meticulously crafted by master woodworkers. All tables are 100 percent solid American hardwood. Olhausen’s commitment to using the best wood available and their attention to detail makes this line of tables the most popular on the market today. The Portland Series is Olhausen’s new Solid Wood line. A quality product offered at an affordable price to suit any lifestyle or home decor. Olhausen uses beautiful grain patterns in its veneer work to achieve a fine, hardwood look without the added price. This line of tables are perfect entry level tables, featuring mark- and heat-resistant laminate at an affordable price. Olhausen’s modern line of tables integrates simplicity of form, absence of decorum, and emphasis on function to create a true twentieth century style. 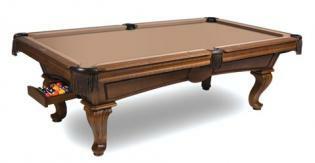 Superior quality, playability, and unparalleled craftsmanship in the billiard industry characterize this table series. Olhausen’s one-of-a-kind pool table made of Ponderosa Pine. Real Pine wood creates the straight lines and functional look of this Olhausen table. 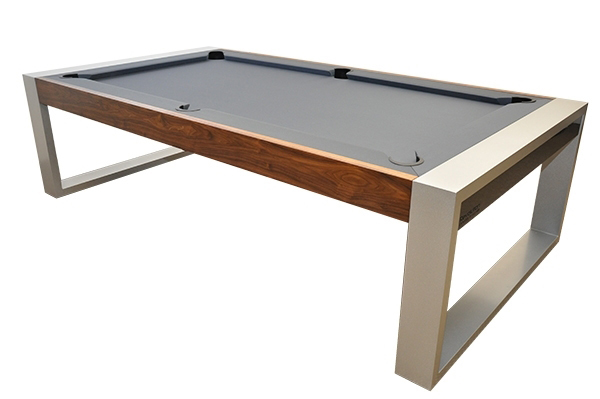 Designed with a functional storage drawer, these pool tables can store your cue sticks, racks, pool balls, or table cover right at your fingertips. 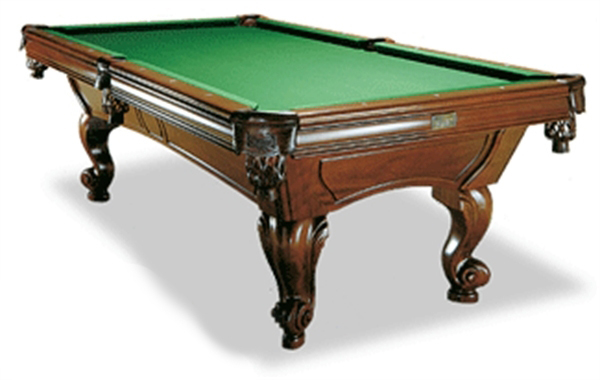 Brunswick has been the market leader for pool tables and game room furnishings since 1845. They offer the industry’s largest selection of high quality products backed by a lifetime warranty, and they are supported locally by the best dealer network in the business. There are reasons why families and professional players for more than 163 years have chosen Brunswick over the competition. With Brunswick, you get the best products and service at competitive prices every day. Nothing says rack’em up like the rustic-meets industrial charm of the Canton pool table. This eight-foot black forest or rustic gray finished table is the perfect marriage of craftsmanship and design. Naturally dramatic, the Black Wolf II table is in its element in contemporary homes from casually chic to sleek and sophisticated. Durable metal rail pocket corners, round rail sights, and jet-black laminate provide the perfect detail. From its luxurious finish to its distinctive legs and pockets, the Bridgeport is built to meet the demands of an active household. Available in chestnut, espresso, or graphite. A great addition to any home, the Allenton comes in cherry, chestnut, driftwood, or Toscana, with your choice of veneered tapered or ball and claw legs. Wood rails, Brunswick-certified slate, and diamond-shaped sights enhance the experience. A great addition to any home, the Allenton comes in traditional cherry, chestnut, driftwood, or toscana. Select the clean, strong lines of the veneered tapered legs, or opt for the solid wood ball and claw leg. Solid wood rails, Brunswick-certified premium slate, and pearlized diamond-shaped sights enhance the experience. 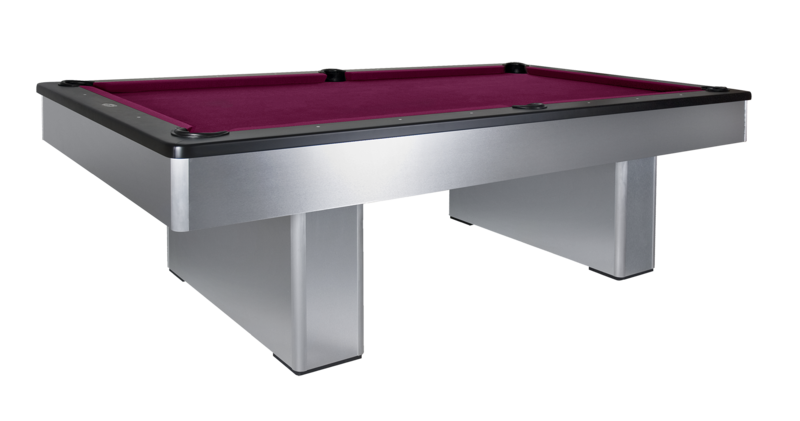 Continuing the Brunswick tradition of excellence, this tournament edition table features longer rails and tighter pockets engineered to strict World Pool-Billiard Association specifications. Table decals included. Inspired by Isabella of France, this table brings history, royalty, and high society to mind. Founded in 1973, <span id=”canada”>Canada</span> Billiard is the largest manufacturing unit and distributor of billiard tables and accessories in Canada. Canada Billiard offers the widest variety of wood (oak, maple, mahogany, walnut, and cherry), stains, and finishes of the industry. Their table structures are assembled with bolts to ensure a solid construction, and they are the only manufacturer to install leveler feet on all their tables. With modern lines and forms, this table comes in 1 ¾ inch walnut or white birch with your choice of stain and an optional drawer. Tale is also equipped with non-slip rubber feet to maintain the optimal level. Assembled piece by piece, The Majesty is entirely made of solid oak or maple and features ram’s head or ball and claw legs. An unlimited choice of finishes is offered to bring out the beauty of the wood species you select. 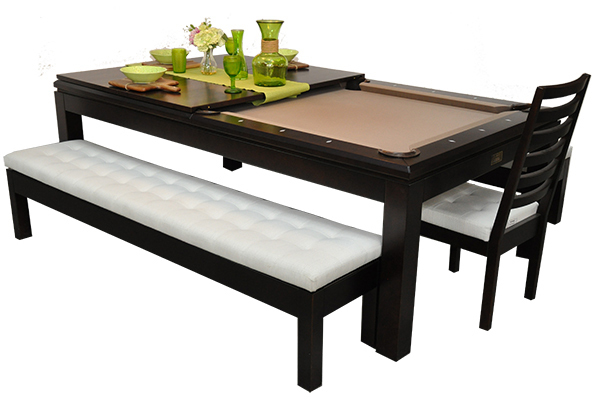 The ideal unit for the recreation, dining, or conference room, this table is constructed of white birch. Your choice of varying heights, lengths, and finishes are available, as well as a set of matching chairs.